Also sumac, soumak - Rhus Coriaria, family Anacardiaceae. This spice comes from the Mediterranean and Middle East, from the berries of a wild bush (although there are many varieties all over the temperate world). It is an essential ingredient for Arabic cooking, favoured over lemon for sourness and astringency. It is somewhat related to poison ivy (Toxicodendron radicans). The berries grow in dense clusters of small, russet coloured, rather hairy berries about 10mm (¼ inch) round. 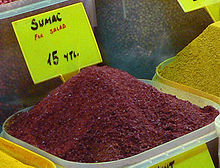 They are dried and crushed into a coarse purple-red powder before use. Quite aromatic, they are sour, fruity and astringent in flavour. See the encyclopedia of spices for more details. This page was last edited on 20 January 2017, at 06:56.